Adam Schefter reports the Oakland Raiders have signed WR Seth Roberts to a two-year extension through 2019. 2017 will be Roberts’ third season with the Raiders. Roberts’ 2016 grade of 43.2 ranked 112th out of 115 qualifying wide receivers. He was inefficient as a receiver, catching just 50.7 percent of his targets (108th of 115). He did, however, earn the third best run blocking grade among all wide receivers, with a mark of 78.3. While inefficient with his targets, Roberts proved dangerous with the ball in his hands. 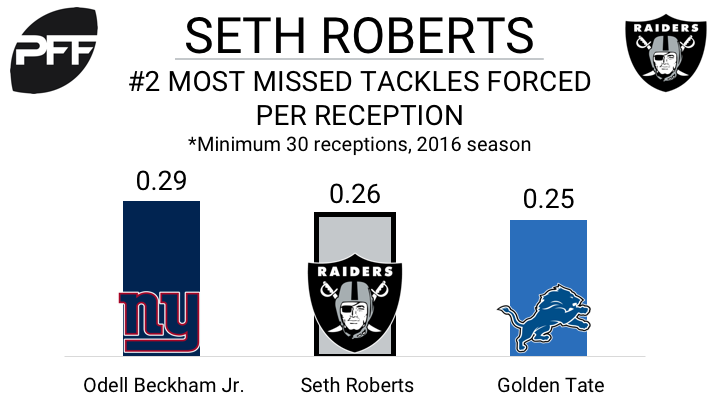 With 10 missed tackles forced on 38 receptions last season, Roberts forced missed tackles at the second highest rate (0.26 missed tackles per reception) among all wide receivers (minimum 30 receptions). He also ranked 16th out of 115 wide receivers in yards after catch per reception (5.4).